As I was going through my scan folder, cleaning up the images, when I got to the final scan of a package from Wes over at JBF, one song jumped into my head. So I went back over the other cards I had scanned and fairly quickly was able to put a song to each scan. It's been a while since I have done a musical PWE, so let's look at Wes' scan from a musical standpoint, shall we? Sure, it's just an excuse to post more videos, but who doesn't like music? With your I-Poos, Twiffer and Snip Snap!!! Going with the Vogues for the new Paulie additions, him being down with work and all. I first thought of "Baby Come Back", but with one of the best records in baseball currently, we're doing pretty well. 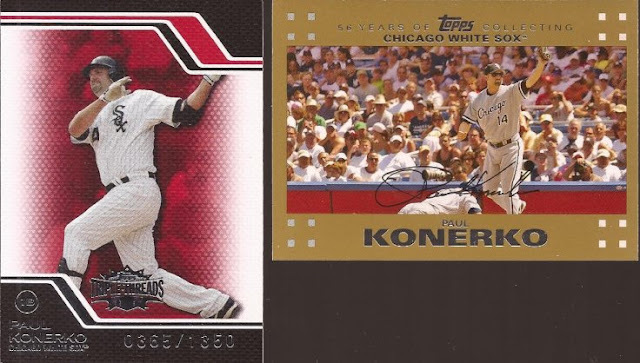 Both are serialed and fine additions to my Konerko binder. For some shiny, but never scan well cards, how about Collective Soul? Though, that Wells on the right looks really good off the scanner. Buehrle on the left, not so great. Magglio in the middle? Completely impossible to see. Whomever has a scanner that does foil well, let me know. I think I need to replace this sucker anyway. No brainer. LOVE English Beat (or The Beat as their proper name is), as well as the spinoffs from that band - General Public and Fine Young Cannibals. 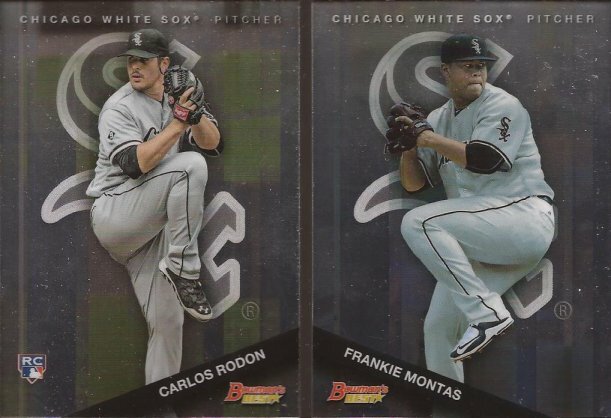 While Rodon and Montas are shiny, and thusly scanned like total crap, I happened to pick them for the mirror image of the cards side by side. Even the badging at the bottom gives a mirror effect. I wish the Sox would go back to the secondary logo on the road sleeves, though. It's a diecut that looks like a CD. 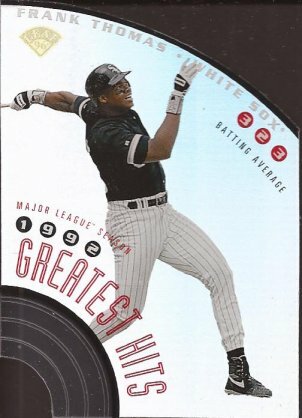 This was the only scan I was a struggling with, but being a card that talks of greatest hits for 1992, I hit the Billboard list of the best songs for that year. With Frank wearing the black tops and white pants, picking MJs song from that year was a no brainer. Also, 90s - amirite? 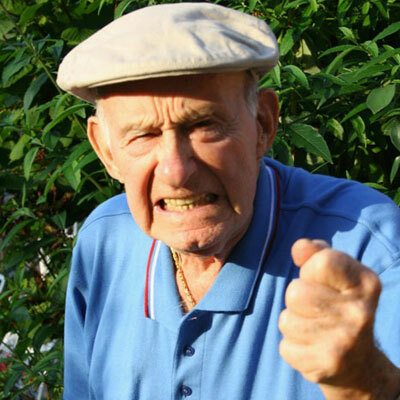 This is the song that jumped in my head when I cleaned up the image of the two fine relics Wes sent. And it's just because of the first line: "You take the good you take the bad". Because Sale - he's good. And Conseco with the White Sox - he was very bad. But I will take gifts like these two cards as they are fine additions to the binder. Most of my Sale relics are gray, so black is a nice change. Plus it's from Tribute. Those packs are out of my price range usually. Thanks again for the cards, Wes. One last thing: Lisa Whelchel. Am I right???? I had never heard "Mirror in the Bathroom" before. That's a catchy little diddy. One of the best records in baseball? They don't even have the best record in Chicago.